This HDMI KVM transmitter and receiver extend FULL HD HDMI signal up to 80 meters via a single CAT cable, without any video loss and time delay. especially for engineering project usage. Such as PoE, 5V-12V wide range power supply, mountable aluminum alloy shieding. 3. No video loss, no time delay. 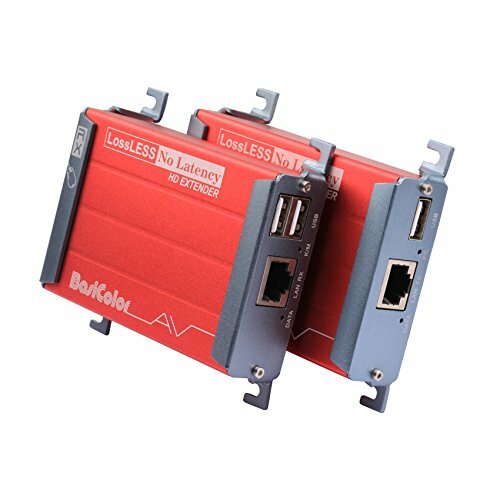 【PoE & Widely used】Support PoE (Power Over Ethernet) function, power supply on either side. Widely Adapt to bluetooth, USB headphone, Camera, Mouse, Keyboard and so on USB to hdmi cable USB poe usb over cat5 kvm extender Suitable for various application scenario, especially for engineering project usage Such as PoE function, 5V-12V wide range power supply. 【FRIENDLY DESIGN】Compact design for carry; With die-casting aluminum case, good for heat dissipation. Mounting ear for easy installation. Engineering level 5-12V wide range power supply, more safe, more stable. We Promise: 24-Hour Customer Email Support, 30-Day Money Back Guarantee, and 12-Month Warranty. If you have any questions about this product by Basicolor, contact us by completing and submitting the form below. If you are looking for a specif part number, please include it with your message.